When writing this TunnelBear VPN review. It comes across as an easy to use VPN service that gives decent security features. With a premium version and a free version that allows you to test their services. It has a strong following of users, yet is TunnelBear safe? Is it ideal for your purposes and will it meet all your needs? Many VPN companies promise to be different from all the others but can TunnelBear do this, or does it just get lost in the woods? 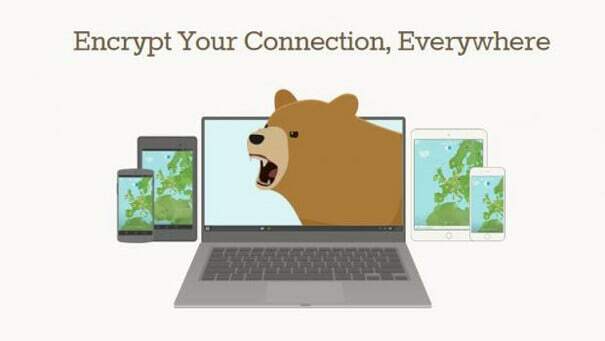 A TunnelBear download can cover most devices with their client software and includes Windows, Mac, and iOS as well as Android devices. There are also browser plugins that can be used with both Opera and as expected a TunnelBear Chrome extension. One key feature is their vigilant mode which will prevent data from slipping through your internet connection should the need arise for TunnelBear to reconnect to a server. Ghostbear is also another main feature that aims to allow for you to connect to sites that have VPN blocking. It does this by disguising all your VPN traffic as regular HTTPS traffic. Although this can be a handy feature, it does give a significant impact on speed due to the extra processing required and has shown a reduction of almost 50 percent, so it is advised only to use this if necessary rather than leaving it enabled. One security feature they have is “Trusted Networks” where you have a whitelist of all the Wi-Fi networks which you trust to connect to. Once this has been activated, TunnelBear will automatically connect to one of the whitelisted Wi-Fi networks if the one you are currently connected to, isn’t a trusted connection. This can be a welcome feature when a VPN changer makes sure you are connected to the safest Wi-Fi. On iOS, the app has a feature that is quite intelligent. You can use the closest VPN tunnelling when you are looking to tunnel or encrypt your data without any concern over geo-restrictions. When you select this closest tunnel option, you get an increase in speed. One other feature Tunnelbear has for iOS is the always on so as soon as you turn on your iPhone or iPad, you are instantly protected. 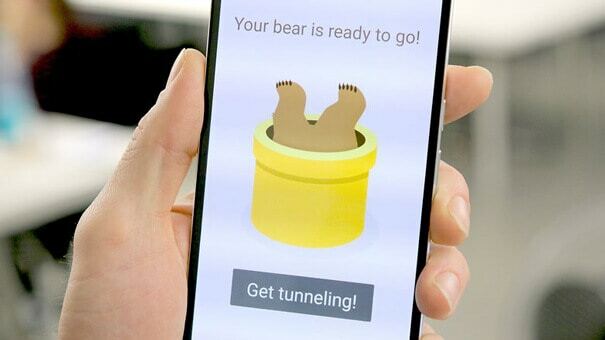 It manages this by putting Tunnelbear into sleep mode rather than closing the app, and data consumption are minimal, so there is no worry of using your monthly data usage. Tunnel bear also works with Kodi the award-winning entertainment platform where you can watch many shows or sports matches. As many links are geo-restricted, it is good to see that TunnelBear decently supports Kodi. The company behind TunnelBear make it well known about their stance on privacy, and they explicitly state they have a no-logging policy even if they are situated inside a 5-eyes region. Although it is difficult to tell what a VPN company does and doesn’t log, TunnelBear makes it more transparent than many other VPN providers of what they do and don’t do. When it comes to pricing, you have the TunnelBear free option which gives a paltry 500mb per month. This might be okay for simple surfing when on the road, yet for anything more than this and you can see it is only there for you to check out what TunnelBear is all about as you might expect for a free Australian proxy. When you sign up, the monthly plans are on the high side unless you pay upfront. Doing this, you get a little over 50% saving compared to monthly payments. This leads to a considerable saving and can make a big difference when you are looking for a VPN provider. Installation is perfect for novice users, and it is a matter of installing it, and you are ready to start using the service with no additional tweaking or settings that have to be altered. Once installed a user is presented with a world map which displays the locations of the VPN servers. Once you select the desired server, it is a matter of turning the service on and then waiting until your device has connected. This interface is pretty standard across all devices so no matter which you use you will be presented with a familiar design. Although the installation is installed and click to go once you have selected your server, there is a little more going on under the hood. For new users, the interface is clean and straightforward, yet the client blocks DNS leaks automatically, so there is no need to search through menus to start looking for answers. As easy as TunnelBear is to set-up and use, there might still be the occasion you need technical support. The company does not offer any live contact and support staff are only contactable through an online form. This might be enough to fix a problem, yet if a user is new and they are unsure how to explain the problem, it might take a while to resolve. The response from the support staff is within the 24-hour period they say which is a good thing, yet for many, it is not fast enough. Australia, Brazil, Canada, Denmark, France, Germany, Hong Kong, India, Ireland, Italy, Japan, Mexico, Netherlands, Norway, Singapore, Spain, Sweden, Switzerland, United Kingdom, and the United States. With what appears to be decent coverage there is no support for quite a few countries that includes Africa, Russia, Turkey and the Middle East, yet some of this is down to the nations having a repressive internet usage policy and not the fault of TunnelBear. On the server front, they do not have the most extensive number even if their locations are only based in 20 countries. They currently just have a little over 350 servers spread throughout these areas. TunnelBear does not have any options to test basic information which would be handy even if it was only load and ping time that you were able to check. Domestic download speeds are average although not the worst as with some other VPN services. Upload speeds are less impressive and reduce the speed by almost 10 percent. International speed tests are more of a real-world example, and the distance between connections plays a big part. TunnelBear is no different in this respect where latency increased by almost 300 percent. Download speeds are slightly better than their domestic scores as is their international upload speeds. Considering they lack a substantial number of servers and server locations, speeds are a little hit and miss, and could be much better as you would expect. Although you can expect speeds that are up and down, it is one thing that you would not hope for when you pay for a premium account or hope to see the best free VPN. One area that can affect performance is the protocols in use, the higher the protection and encryption the slower the speed. TunnelBear gives two protocols. OpenVPN is used on clients that run Windows, Android and Mac OS while iOS users get a choice of Layer 2 Tunnelling Protocol/ Internet Protocol Security or Internet Key Exchange version 2. Encryption is right up there with any other VPN providers who use 256-bit AES (Advanced Encryption Standard) with SHA256 authentication. This is used across all platforms apart from any device that runs iOS 8 or earlier. Even with gripes, TunnelBear Australia can be a decent solution for your VPN needs, and it is easy to see why it is a crowd favourite. If watching US Netflix in Australia or downloading torrents isn’t a priority then this may be the service for you. The speed issues might not be much of a problem as it is these services that are data intensive compared to regular browsing and making sure your data is protected and safe. This is where TunnelBear excels in its offering. 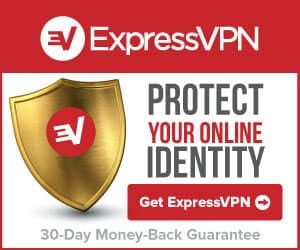 They are a robust and secure VPN service provider that has a stable company backing it up, even their free online VPN gives high security as does their Chrome VPN extension. TunnelBear at the moment works in China (for some users) although this has been hit and miss depending on users who have reported on it. It would be much easier if we could say yes it does work or no it does not. As it might do. This is not a feature to comment on one way or the other. It might be the case TunnelBear Australia free is the way to go to test this feature rather than wasting money. 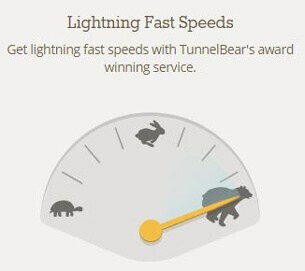 For a VPN for security among a top priority, TunnelBear appears to be better than a few options that are on the market. However, they do retain logs of bandwidth usage and timestamps so the possibility is always there they might have to hand them over. Apart from that TunnelBear stands above many yet others quickly overshadow it to the same degree. It has some useful features yet with no torrents or no Netflix this is enough to break a deal for any user who is searching to get VPN either a free VPN Service or the best VPN.